The deluxe rooms have marble flooring, bespoke mahogany furniture, hot and cold water, air conditioning and a digital safe. Outside there is a terrace with table and chairs. Beachfront rooms have spacious sun decks with day beds. The large and spacious fan dormitory has an ensuite 2 cold showers and 2 toilets and houses 12 beds with large lockers to accommodate backpacks. we also have a restaurant at the resort . we are not the cheapest restaurant but our price is affordable. in case you are looking for cheap restaurant , there are available restaurant and barbeque seafood and meat just minutes walk away. Loved it here... Only had two nights due to availability. However i would havw stayed for a week easy. 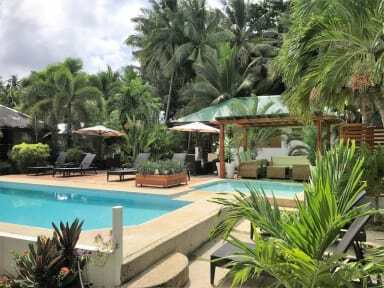 One of my favourite hostels in the Philippines. A pool, facing a beach, with a bar inbetween - what's not to like? Hammocks, decent food, and a nice relaxed atmosphere. Great place. Lovely place with pool, bar and restaurant right on the beach. The staff are very friendly and there’s bike rental right outside. The only downside is that the dorm felt like they had a spare space and shoved some bunk beds in it. There’s not enough plug sockets and wires draping all over the place to plug fans in. There’s no air con and it’s extremely hot at night. There are lockers big enough to fit your backpack in (bring your own padlock). The only dorms on the beach in San Juan! Salt water pool is lovely but closes early at 8 pm. Beachfront view is spectacular with hammocks and sunset should not be missed! Lounge chairs on beach but some broken. WiFi is great in dorm but mediocre in common area. Restaurant is well-priced and food is hit and miss. Some towels and linens are old and shabby but dorm is clean and well maintained (fans only). Staff are very sweet but not highly knowledgeable about travel info. Best dorm in San Juan! When you arrive, you definitely understand why it's called Resort and not Hostel, this place has a pool and access to the beach, with hammocks and lounge chairs, mango shakes aplenty. Food here is also really good and facilities are great No hot showers, but why would you need one anyway. Great place to stay ! This is a hotel with 1 dorm room. Right on the beach with hammocks to relax. I wish they took better care of the animals. They had a kitten that was clearly sick and don't even notice :( I had to tell the staff that he needed a vet and they seemed shocked when it was obviously sick. Everything was okay, but the rest of the resort seems to be pretty good. But the dorm hostel has no AC.